Is anyone else having difficulty posting replies? The site has been unavailable a few times in the last few months, haven't noticed anything else. Edit: Just got another error 504 gateway unavailable. On this past Tuesday July 17, it hung in preview when I posted to the Combining uniforms Thread in Fan Art. 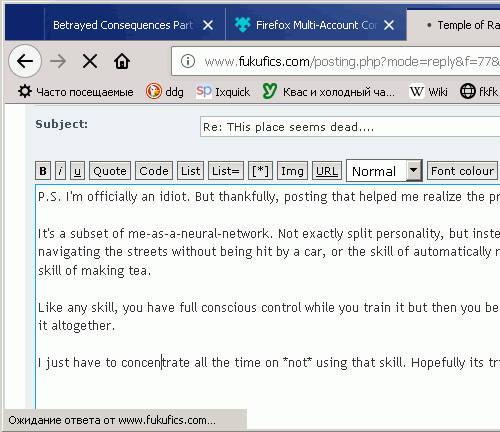 I opened Fukufics in a new tab and the post was there, so I closed the tab where it was hung in preview. Edit: This posted with out problems. Edit 2: On the other hand when I tried to post just now in the "THis place seems dead..." thread in Other Talk, it hung in preview, but opening a new tab showed it had posted. I've been having trouble posting. So I just open another tab, and use it to look at the rest of the web. So far, when I come back (after some while) the post has been accepted. Got a 500-something server error when posting to “THis place seems dead...”. Been getting 500s at other places I think are on the same cloud or whatever. Edit: Got a 504 timeout on this post.